With Passport Ultra Lite, we make it easy to stamp the mind with memories, help the kids fill their pockets with precious knick-knacks, create a one-of-a-kind album of snap shots. Because Passport is lighter and fully equipped, it is easier to grab and go, giving you plenty of opportunity to hit the road on a moment’s notice. Whether you are looking for a small, couples coach that can be towed with a crossover vehicle, or a larger family bunk house model that doesn't require a big truck, Passport has more Ultra Lite choices for you. Go ahead and fill the blank pages and enjoy the story as it unfolds. Each purchase includes an interstate battery, full propane tanks, full inspection by an experienced technician, and a walk through at the time of pick up. We have no hidden fees, just a document fee! Thank you for taking time to visit our website. We are a family owned business that has been in operation now since 1992. We pride ourselves on creating a friendly small town atmosphere with experienced sales staff along with great prices on our entire inventory. 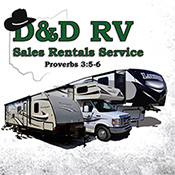 We offer a wide range of new and used RV product lines that is sure to fit into anyone's budget and needs along with quality used cars, trucks, vans, and SUV's. We also have a full service and parts department with experienced technicians and friendly staff. Please visit or call our dealership before making a decision on purchasing a RV or used vehicle. You won't be disappointed.